Demanding people (I call them “ the demanders”, since it sounds like a rogue team of bossy villains laughing maniacally. Then again, my imagination is a vivid one). I encounter the demanders more often than you’d think, in real life, not just my imagination—in which I’m “the responder”, my superhero alter ego with a mask, perfectly styled head of hair and a skintight uniform to disguise my identity. Why is it skintight? Well, in my imagination, you see, I’ve been really good about doing a lot more work on my core and avoiding doughnuts. Back to “the demander”, who naturally uses his or her powers to attempt to trap me: “You’re a yoga teacher? Cool…show me something really impressive!” This is a typical response when I interact with someone for the first time at a party, a gathering of people in which I’m new to the flock, or at a networking group (yeah, that last one really got interesting!). To me, surely this must be what stand-up comedians deal with when they encounter a “demander” upon divulging what they do. The plummeting sense of dread they feel when they hear the inevitable “Say something funny!” Oh, the pressure! I suppose I’m a novelty when I share that I have taught yoga over the course of the past 3 decades, and that I created multiple programs to teach teachers. 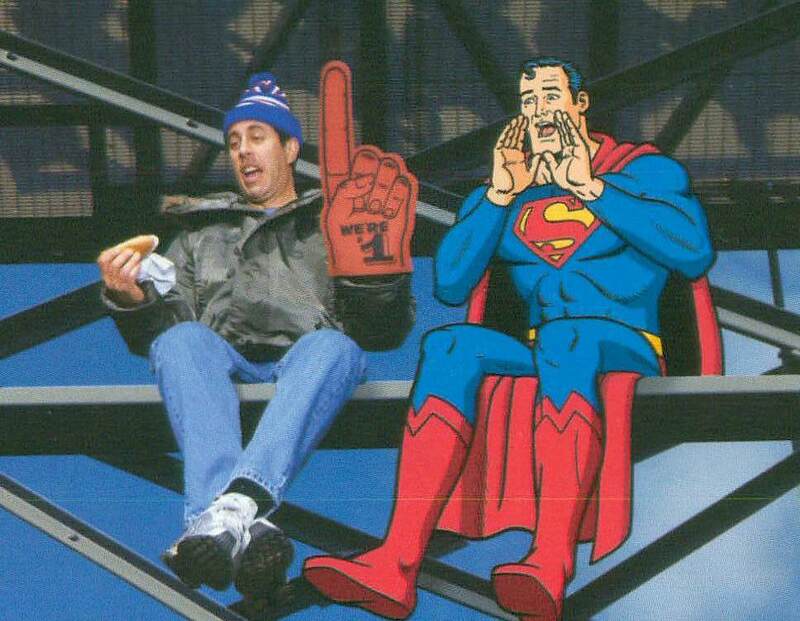 But, come on…Jerry Seinfeld just wants to enjoy the game with his friends and eat his hot dog in peace, people! 1) I could “perform” and demonstrate an impressive pose that takes years to master, reveling in the “ooh’s” and “ahh’s” that would surely follow (well, unless it’s a balance pose and I topple over…then I would hang my head to accept the deserved uncomfortable quiet giggles I would likely overhear). 3) I could use the opportunity to talk about what yoga really is…more than just a fancy-looking pose, extreme flexibility, and being obsessed with how your feet look because you’re barefoot when you practice (trust me, pedicures are your friends). It is typical in our society to hear the word “yoga” and think of “asana” (the postures associated with Hatha Yoga—which simply means the physical practice of yoga). What most people do NOT understand is that asana developed out of a spiritual practice…in essence, the asanas were created so that the ancient masters (mostly monks) could sit and meditate for long periods of time. Think about it…when you have to sit for a LONG time (as in long, boring meetings, an opera you’ve been dragged to by your culture-craving wife, or, to be fair to both genders, a football game you’ve been dragged to by your referee-cursing and beer-craving husband), what is the first thing you do when you stand? You stretch and MOVE AROUND! Notice your cats and dogs when they get up after a long nap. They intrinsically know what their bodies need (clearly a LOT more sleep than I’m getting, which sometimes makes me feel sassy enough that I wake them up, just because it’s not fair). But, I digress…so, back to the spiritual side of things! Recent polls have indicated that over 70% of those who start yoga do so for physical reasons…I cannot stress enough to these folks that yoga is so much more than that. While it certainly IS a fantastic way to maintain or build flexibility and muscle tone, increase cardiovascular function, improve digestion, etc. (the list goes on and on), yoga is quite literally the way that I survived my own physical issues…and not merely by doing asanas. I began my own practice in 1986, for physical reasons, like most…rehabilitation of a knee injury/surgery. What I found was so much more…a gift that I HAD to share with others (much to the dismay of my parents, who would have liked to have seen me finish my schooling to become a doctor…it was close enough that I could taste it). As a young woman, I dealt with anxiety, depression, and feelings of hopelessness surrounding my physical issues (not to give you the extensive list here, but I have had my share of surgeries, chronic daily pain, accidents, broken bones, and most notably, three bouts with cancer). Had I not been introduced to the spiritual side of yoga, I don’t know how I would have gotten through any of it. Let me explain. You’re surely familiar with the phrase “the present is a gift”…how true this is! We cannot change the past; therefore, to dwell in it and contemplate the “what if’s” is pointless. We do not know what the future holds for us; therefore, to worry about it only creates anxiety (and, many times, what we are worrying about doesn’t happen!). Being PRESENT for each unfolding moment is what we can control…not the actions of others, or situations we find ourselves in, but our reactions to them. We can choose to be joyful while acknowledging that our situation might not be what we would have chosen. Due to complications, I was bed-ridden (or close to it, instructed not to walk around more than absolutely necessary) for the better part of my pregnancy, and it seemed that everyone close to me worried for months. I took each day as it came, remained present-minded (even though I had moments of frustration, wanting to be my usual self, up and about! ), and the end result was a healthy baby boy! Mindfulness is not a practice that comes easily to most of us…and that is why it is a PRACTICE! Breath is sometimes referred to as the “bridge” between mind and body. As soon as you feel your body responding to a situation negatively, notice your breath…chances are it is shallow and fast. By consciously slowing the breath (and incorporating pranayama—breathing practices—if you know them), there is a positive physiological response. By breathing in this way, we become attuned to thoughts and feelings, thus allowing us to see the “cycle”: negative feelings = “restriction” in the body = uneven breath. This cycle can easily be reversed: slow, easy breath = relaxation response in the body = positive feelings. The best part of this? You can practice it anywhere, and you are the only one who has to know! So it’s simple…change your mindset. Not just about yoga, but anything you feel that you have knowledge of when you come across an expert. Open your mind and listen…you just might learn something new. By the way, my “back-up plan” should this whole yoga / stress management gig not work out as planned? Stand-up comedy…with a pager for when I’m needed to fight crime. Debra Hennesy is an E-RYT 500, CPT, and has a whole lot of other impressive-sounding credentials that are acronyms. You can learn more about her, the internationally-recognized teacher training programs she has created, and the work she is currently being called to do (stress management and business consulting) by CLICKING HERE. Yes, you can be a superhero too!